After a harsh betrayal, Magnus "Strath" Sutherland, Laird of Dornoch, accepts a commission from the king to squelch an English lord's siege at the Scottish border. What better way to torment his new English enemy than to defeat his army and steal his beautiful bride? At first, Strath plans to toss the Sassenach lass into a dark cell and forget about her, but there is something about the way she defies him that he finds alluring, not to mention how very much he'd like to kiss her. Eva de Clare, youngest daughter of the Earl of Northwyck, is pledged in matrimony to a cruel lord blackmailing her family. 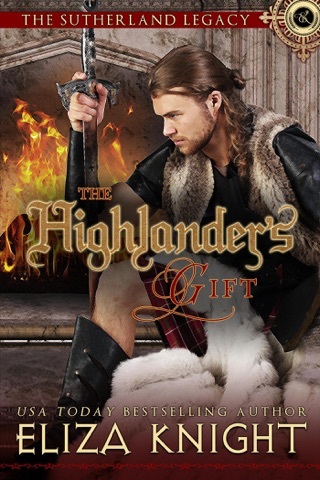 Her salvation comes in the form of a terrifying Highlander who interrupts the ceremony. But salvation turns to horror when she's plucked from where she stands and whisked across the Scottish border. Eva isn't about to be made a prisoner of war, and once she sees the kindness beneath her captor's hard exterior she decides she won't be sent back to England to be wed either. In fact, she just might be the woman to warm the Highland warrior's hardened heart. Read more in the series! Want to immerse yourself in the Sutherland world? Check out these other books!